The Vita is currently struggling to find a market worldwide. In North America, one would think that a Call of Duty game would be a simple solution to that problem. After all, what would be a bigger draw than one of the bestselling franchises in the country? It seems like a no-brainer, but something that should have been a surefire recipe for success somehow turned out to be an unmitigated disaster. 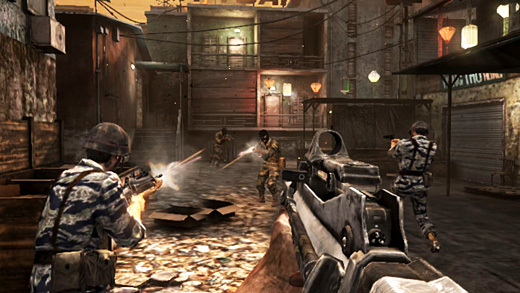 Call of Duty: Black Ops Declassified is a first-person military shooter that's supposed to fill in the story gap between the console versions of Black Ops and Black Ops 2. Unlike those titles, Declassified isn't developed by Treyarch. Instead, dev duty was handed over to Nihilistic, a developer who most recently worked on another Vita first-person shooter (FPS), Resistance: Burning Skies. Being the developer's second shot with the hardware, one would have expected a more complete experience, but that was not to be. The first area where Declassified is found wanting is in its single-player modes. The story is told over the course of ten operations, though suggesting that there is actually a story here is a bit of a stretch. The game quickly jumps from mission to mission with only short briefings beforehand and a little additional info afterward. This is somehow supposed to bridge the story gap between the console releases? It doesn't seem to tell any coherent story at all. What about the missions themselves? First off, there are no checkpoints in missions, so if an operation is failed, it's right back to the beginning. Most of them are fairly simple to complete, but there are a couple that will likely require multiple attempts. These aren't extremely challenging, so much as they are frustrating—repeating even brief sections over and over grates on the nerves. That said, each operation only takes about five to ten minutes, so the entirety of the campaign is over in less than an hour. This is supposed to be a single-player mode? It's barren. There are two other solo modes: Time Trials and Hostiles. In Time Trials, players get to blast through one of five training missions, each taking around a minute. The point of this mode is to shoot targets while avoiding civilian casualties. Like the campaign, there's not a lot of depth. Hostiles mode has a bit of length to it, as it places the player in a zone to battle waves of enemy forces. That said, there are only five different stages and it's only available solo, so even though it lasts longer than the other modes, it lacks a hook to hold interest without the multiplayer social aspect that makes most Horde modes interesting. 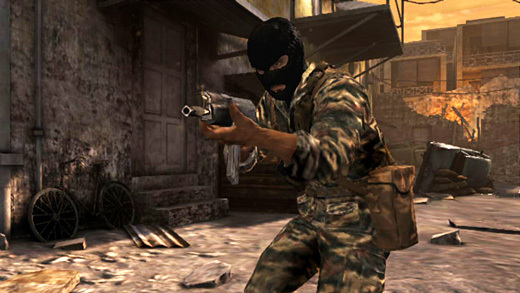 With only an hour or two of single-player content, Declassified needed a strong multiplayer presence to save it. There are five different modes available in multiplayer: standard Deathmatch, Team Deathmatch, dog tag gathering Team Deathmatch, team-based zone protection ("Drop Zone") and finally, a mode that simply shuffles up the three team modes. These modes could have been a great boon for Declassified, but the online play is inconsistent, and not being able to reliably play kills any hope of that. In my experience, the game would sometimes inexplicably jump back to the multiplayer menu without a warning. A few times, a connection error popped up while just trying to access the multiplayer mode. During one match, the game completely crashed and had to be restarted. There's already been a patch and there's talk of another, but as of this writing, multiplayer is spotty at best. This is a shame, because Declassified runs smoothly when it works and has similar level-up hooks compared to those its console brethren offers, but it needs to be stable to be successful. If this gets fixed that could be fantastic, because the multiplayer modes are actually enjoyable. Declassified was a painful experience because it actually plays and controls very well. Movement is responsive, targeting has an assist feature which helps with aiming, and FPS controls map wonderfully to the Vita. The touchscreen is useful for throwing grenades or using melee attacks, for instance. Everything feels right, so for a game with such a solid foundation, the fact that it's so shallow in single-player and so spotty in multiplayer is awful to see. With more time and care, this might have actually been a solid game. It's impossible to tell where the fault lies with Call of Duty: Black Ops Declassified. Did Activision force Nihilistic to rush it out the door? Did Nihilistic simply put out the bare minimum effort? Is this half-hearted experience exactly what Activision wanted? Regardless of the reasons behind it, what we've ended up with is a completely wasted opportunity to bring some heavy firepower to the Vita. This is a repost from GameCritics.com.